1875 January 14 Bredisholm Bothwell, LKS Provanhall Coal Co James McEwan Collier 20 Falling from part way down He pushed a tub into a “blind” pit and fell along with it a depth of 13 fathoms. It was the first day of the pit being used, and the gate had not been put on. Gates have since been put on. 1875 February 3 Braehead No 5 Baillieston Dunn Brothers Wm Clelland Collier 22 Falls of Roof & Sides Fall of roof at face. 1875 February 8 Bankend Lesmahagow, LKS Monkland Iron & Coal Co Ltd Robert Brown Engineman -- In Ironstone mines Explosion of boiler of a pumping engine. The boiler was worn out. It exploded some time during Sunday night and no one but deceased was near. It was supposed he had fallen asleep after firing the boiler and allowed the steam to get too high. From Main body of report: The boiler supplied steam to a pumping engine at a pit which stood in an isolated position, and out of sight from any houses. The engine did not require to go continuously. Deceased was the engineman; he commenced work at 6 a.m.. on Sunday morning, and was standing his "long shift." No one was near him or had seen him from that time until about 4 o'clock on the following morning (Monday), when his body was found in the engine house, and the boiler exploded. It was conjectured that deceased had fallen asleep after firing the boiler, and before he had started the engine after one of its pauses, thus unduly raising the pressure of the steam, and the explosion was the result. The boiler was pressed at about 20 lbs. to the square inch, and had all the appliances required by the statute, but it was at least 10 years old. 1875 March 19 Hallhill No 1 Baillieston Ferrier & Strain Robert Gibson Collier 18 Falls of Roof & Sides Fall of roof at face. 1875 April 28 Drumpeller No 4 Coatbridge, LKS Henderson & Dimmack John Weir Collier 20 Explosions of Firedamp. Died 10th May Explosion of fire damp. From Main body of report: Happened in a limited working lately win by a stone mine, and in the act of being opened up. The deceased had worked a day shift and left about midday. On their return in the afternoon they were the only persons in the pit, and after having been engaged for about three hours brushing their roadway, they proceeded to a wall a short distance from their own, and ignited some firedamp which had collected in it from the time of the day workmen leaving, about three hours and a half before. Both were burned, and though not supposed to be dangerously ill, they died from the effects of their injuries two weeks after.The deceased who were engaged in a limited working had left off work on the day of the accident about midday, but returned in the evening (5 o'clock) to "brush" their roadway. Their working place was situated at A on hand sketch, but it appears that they had left it at 8 o'clock and gone into the heading B, to obtain the use of some tools which they knew to be lying there, when their lights ignited a small accumulation of firedamp. They were both burned, and died two weeks after from the effects of the injuries. It appears that the oversman and others had worked with open lights in the heading B on the day of the accident, and had left it only half an hour (at 4.30) before the deceased returned to their work, and I understand were not aware of the presence of firedamp. 1875 April 30 Gartshore, No 5 Kilsyth Wm Baird & Co Robt. Barrowman Miner 35 Explosions of Firedamp Explosion of fire damp. From Main body of report: The deceased was a miner, and I understand that he had a contract for forming a stone mine to prove the seam of coal to the west of a dislocation not far distant from the shaft. It appears that the contract had expired, and other arrangements had not been made. In consequence of which the mine had been abandoned, or was standing for nine days previous to the accident. On the day of the accident the deceased applied to the oversman for liberty to go into the mine to remove his "graith," or tools, which had been left there when the contract expired. He was referred to the fireman, who would first examine the mine and see that it was safe for persons to enter. The deceased, however, apparently trusting to his previous experience, descended the shaft, and without waiting for the fireman recklessly went into the mine with an open light and ignited some gas which had collected in it. The blast displaced the brattice, deranged the ventilation, and it was two hours after the explosion before the deceased could be relieved, when he was found dead or dying. From Main body of report: Took place in one of the ordinary working places, and while the workmen were engaged at their work. Attributable, it would appear, to a fall of roof in the aircourse, which occurred a short time before, the accident, interrupting the air and thus allowing firedamp to collect. The explosion was reported to be slight, but the deceased died from the effects of his injuries eight days after. The deceased was engaged with others on the day of the accident in one of the ordinary working places of the mine. I understand that a fall of roof took place during the shift, which interrupted the circulation of the air. It is stated that the workmen on the "dip" side of the fall left off work immediately after it happened, and called upon their neighbours, of whom the deceased was one, to leave also. They, however, continued to work, when soon after a slight explosion took place; more than one was injured, but the deceased died a week after from the effects of the injuries. 1875 June 28 Garturk No 1 Coatbridge, LKS Rochsoloch Iron Co John Maule Fireman 55 Explosions of Firedamp Explosion of fire damp. From Main body of report: Happened to a night fireman who, after examining the working places with a safety lamp, went incautiously into a mine connected with an old working, where "waste" water was being run off, with his open light and kindled some firedamp, by which he was fatally injured.The deceased was fireman, and acted as foreman brusher, that is, he superintended the brushing during night. It appears that he went to his work on the morning of the accident about 12.30 a.m., and was accompanied by three of the workmen. As explained by one of them he made the required examination, and afterwards left to shut off water which was occasionally drained off an old "waste." In about ten minutes after his leaving there was an explosion of firedamp, and on search being made the deceased was found at the entrance leading into the old waste, where unquestionably he had encountered firedamp whilst using an open light. The ordinary lamp, which apparently he had been using, was found near to him, but his safety lamp was got at the face of one of the working places about twenty yards farther off. It would appear that after examining the working places the deceased had laid aside his safety lamp, and at the time of the accident was imprudently using an open light. It is difficult to account for such inconsistency, for certainly the place where the accident happened was one where firedamp was more likely to accumulate than in any of the working places. From Main body of report: The sufferers in this case were sinkers, and at the time of the accident were being raised in a kettle to the surface, but the engineman instead of stopping the kettle at the usual landing at the surface raised it to the pullies and crosshead, and the deceased came violently into collision with them, and were mortally injured. The engineman was charged by the Procurators Fiscal of Stirling with culpable homicide, he was tried at the Autumn Circuit Court held in Stirling in September last and sentenced to three months imprisonment. From Main body of report: The other fatal accident was also caused by the gross negligence of the sufferer, who was oversman of No. 7 pit, belonging to the Rawyards Coal Company, near Airdrie. The pit had been newly sunk to the Kiltongue coal, the levels were in about 30 yards from the shaft, and they were breaking off the "long-wall heading." The deceased and four others were blasting down the roof, within 20 feet of the face. They had knocked out the bratticing, and thus prevented the air from reaching the face ; the consequence was that fire-damp accumulated in it and reached them. They persevered, however, boring a hole with the light of a "Davy" lamp, and when it was ready to fire, they ignited the fuze with a piece of match paper. As might have been expected, when the shot went off it fired the gas, and burned him and the four others, who were within 20 yards of him. He died a few days afterwards ; the others, who were not so much burned, recovered. 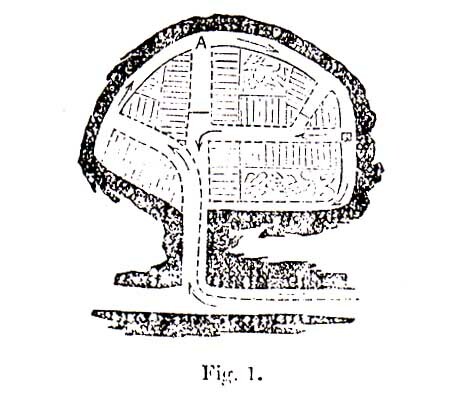 From Main body of report: The pit is in the act of being sunk and is 46 fathoms deep or thereby. It appears that on the day of the accident the deceased, who was the leading man on the shift, had occasion with others to overhaul or put in a new joint in the ''clack door'' about 11 fathoms above the bottom of the shaft. After making the change it was found that the pumps were not acting, the water was "hanging" in the pumps, and the engineman after driving the pump rods for ten minutes stopped them. After a short cessation the engine was again started when the "clack piece" suddenly burst, and part of it is supposed to have struck the deceased and driven him off the scaffold, at the "clack seat'' upon which he was standing at the time, to the bottom of the pit. The clack piece was well tested, and had been in use for a number of years. There is no evidence to prove it, but I am of opinion that the pump rods and column of water had been allowed to descend at an excessive speed considering the circumstances, and coming violently in contact with the air and water lodged between the bucket and the " clack " produced the result described. From Main body of report: This pit is in the act of being sunk and at present is 328 yards deep. The deceased was at the time of the accident engaged with two neighbouring workmen putting in a set of pump rods. They had the usual tackle and appliances for such work. The rods were lowered by a steam crane and wire rope, and the deceased and his neighbours were raised and lowered in a kettle attached to a wire rope worked by the winding engine. I understand that some time before the accident, the crane or crab rope, when hanging in the shaft, got entangled with the winding rope, at the end of which the kettle, with its occupants, was hanging. Their attention was directed to this, and it appears that several attempts were made by them to disentangle the ropes and free the kettle but without success. The signal wire also had in some way got jammed between the ropes, and during this unfortunate state of things the engineman put the engine in motion and raised the kettle. It had not proceeded far when the heavy "crab" rope, still entangled with the winding rope, forced the kettle against the pumps, or shaft fittings, and the deceased was in some way forced off the kettle and fell to the bottom where he was afterwards found dead. The pitheadman stated that a "slight signal" had been made some time before the engineman raised the kettle ; this was unknown to the persons in the shaft, and if such a signal was made it must have been by accident. However, it is not stated that more than one slight signal was given, and the engineman did not hear it. Under the circumstances the signal to raise the kettle was three, the usual signal for raising men. The accident was in my opinion occasioned by the engineman disregarding this important regulation.